Tia Booth isn't too thrilled ABC has cast her ex-boyfriend, Colton Underwood, as the next The Bachelor star. After filming Bachelor in Paradise's fifth-season reunion special in Los Angeles last week, Tia opened up to Ashley Iaconetti for an Access interview about how she'd feel if Colton became The Bachelor's new leading man. "Honestly, it probably wouldn't make me feel awesome. I probably wouldn't want to watch it. Even just as being friends, it would still be kind of weird," Tia explained. As shown on Monday night's episode of Bachelor in Paradise, Colton dumped Tia because he wasn't crazy about her, nor could he envision her being The One with whom he'd spend the rest of his life. Tia was clearly devastated and told Colton he needed to focus on himself and figure out what he wants before he could fully commit himself to a woman, but on Tuesday morning, the announcement was made Colton will star as the Bachelor on Season 23 in 2019. "Honestly, I would be supportive of Colton," Tia told Access. "Like, yeah, I'd be supportive of that, but seeing how much he struggled in Paradise -- one, with seeing [Becca Kufrin], and two, for not being ready for a relationship with me -- I don't really know how he would handle having to hurt people, like, emotionally every week. If he was so worried about hurting me, one person, how would he be able to handle that?" Tia had a distressed look on her face during her interview with Ashley, and it was apparent she was truly in love with the 26-year-old Cystic Fibrosis charity founder and former professional football player. Tia joked she needed to sit down with Ashley, drink wine, and have "a really long conversation" about her feelings on Colton becoming the Bachelor. Although Tia doesn't seem to think Colton is ready for such a big opportunity, she had kind words to say about him after Monday night's Bachelor in Paradise episode aired. "Never ever regret following your heart. Things may not always work out as you planned, but they always work out as they should. Thankful that this chapter of our lives has ended so new chapters can begin. 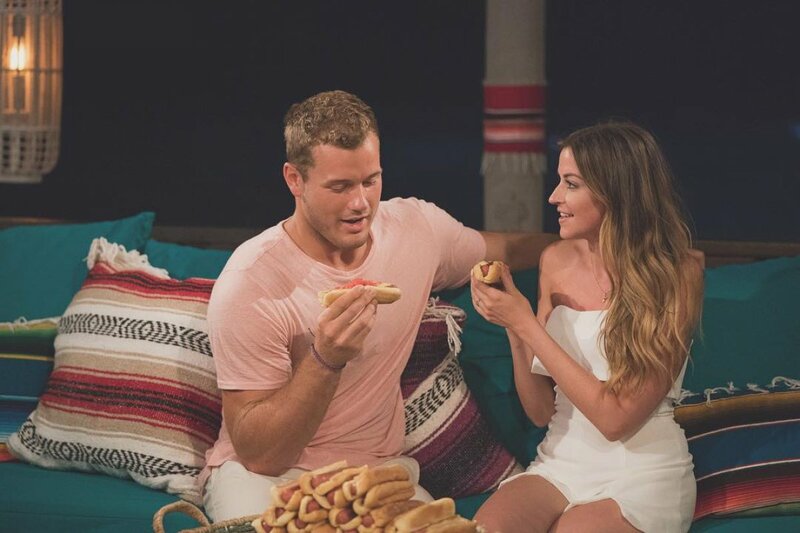 I truly wish you the best, C. #peaceoutparadise #hotdogsforever #thankseleven," Tia wrote on Instagram alongside a selfie of the former couple. And Colton wrote of the Arkansas native and physical therapist on his own Instagram page, "Thank you for teaching me even more about myself, and most importantly, for your friendship that I know will continue far beyond Paradise." Colton added, "Don't settle for anything less than the world, because that's what you deserve. Can't wait to see what the future has in store for you and catch up on life some day, preferably over a hot dog dinner." Colton and Tia briefly dated earlier this year before Arie Luyendyk Jr.'s season of The Bachelor began airing but they called it quits due to long distance and Colton's casting on The Bachelorette's fourteenth season. Colton was hesitant to get romantically involved with Tia again following his crushing breakup with Becca on The Bachelorette; however, once he received closure from Becca, Colton decided to give his relationship with Tia a fair shot. The pair seemed smitten with each other and became boyfriend and girlfriend on Bachelor in Paradise this summer, but it didn't take long for Colton to realize their romance was not going to last forever. Colton has struggled to make sense of his feelings and emotions in recent months, but he insisted Tuesday on Good Morning America he's absolutely ready to get engaged and married shortly thereafter to the woman of his dreams.